Check back as specific details regarding the 2017 Pack and District Pinewood Derby become available. If you pick someone at random and ask them to tell you about an iconic image of Cub Scouting, chances are they'll talk about some Norman Rockwell painting they have seen. But right behind Norman Rockwell on their list would have to be a Pinewood Derby car. For nearly 60 years, Cub Scout families have been spending time together, designing and crafting extraordinary creations from simple rectangular blocks of pine, four plastic wheels, and four nails. And, in our age of computers, iPods, multiplayer online video games and 650+ channels of barely watchable television, the idea of a boy and his family taking time out from all of the beeping and buzzing electronic distractions to build something together from scratch takes on a whole new level of importance. If you want, you can spend many late nights (and literally hundreds of dollars) buying the tools and crafting the perfect Pinewood Derby racer that burns down the track. Maybe you'll be the envy of the other parents. But if you focus only on the perfect car FOR your son, you might miss the bigger point -- the time spent WITH your son, working TOGETHER to build a car. Your son won't remember the slight paint blemish, the sanding mark, or the axle that wobbles a bit. But he will remember the time he spent with you, building HIS car from HIS design out of a simple block of wood. And your son will keep those memories forever. in mind, your scale may vary slightly from the scale used at the actual Pinewood Derby, and the event scale readout is final -- you should be prepared to reduce the weight of your car (if necessary) to qualify for racing. A drill will be available on race day to remove weight from the bottom of your car if necessary. Dimensions -- Maximum width 2 3/4 inches. Maximum length 7 inches. Width between wheels 1 3/4 inches. Minimum bottom clearance between car and track 3/8 inches. 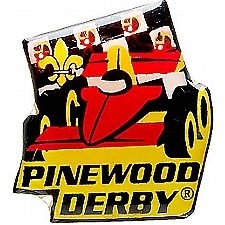 Refer to the instructions included in your Pinewood Derby car kit for further information. Lubrication -- Dry graphite lubrication is permitted. Please do not use any wet oils as they may damage the plastic wheels or the track. There will be graphite lubricant available on race day. Complete race rules are attached at the bottom of this page - these rules are the same as the rules for the District Pinewood Derby championship. For more information on the District race, please click here. The Plattsburgh Press-Republican did a great feature article on our winter 2011 Pinewood Derby in Ausable Forks. You can click here to view the complete article.